Tours depart at 14.30 throughout the year. A morning tour is available at 10.00 from February to October. The Third Reich Walking tour operates all year. We are comparing Berlin's Infamous Third Reich Sites Half-Day Walking Tour Prices from leading ticket suppliers and Try to find you Cheap tickets prices on the market. With a local historian guide take a step back into 1933-45, to the rise of the National Socialist Party, when Adolf Hitler and his Nazi army took control of the city of Berlin and began the Second World War. During this 3.5-hour walking tour you will visit major landmarks and monuments of the 12-year reign of the Third Reich. Hear about the persecutions, restrictions and tragic tales during this period and visit the site where atrocities of the SS and Gestapo secret police took place. Your guide will show you to the remains of Anhalter station where the thousands of Berlin's Jewish inhabitants were sent to concentration camps. 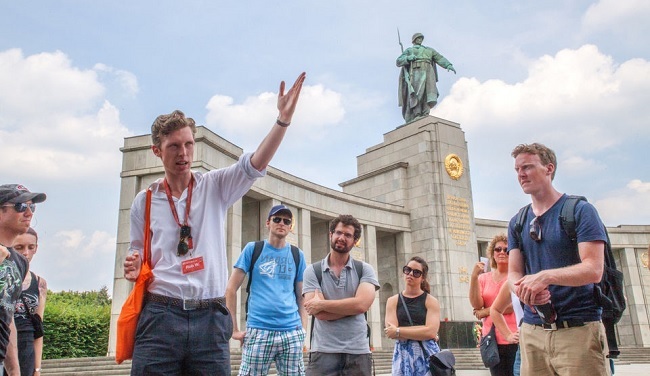 Visit the thought-provoking Holoucaust memorial, stand above Hitler's Bunker, gaze into the vacant space where the Burning of Books took place and see the memorial to the Soviet soldiers who died liberating the city. Ideal for historians and anyone interested in the Nazi's occupation and rise to power. Suitable for individuals or small groups, adults and older children. Your Experience With Berlin's Infamous Third Reich Sites Half-Day Walking Tour? Take a trip to Nazi Germany and see the former Luftwaffe, SS and Gestapo Headquarters, on a compact half-day walking tour. Discover the demolished site of Hilter's Bunker, where the Nazi leader ended his own life. See examples of Third Reich architecture and learn about the Nazi take over from an expert historian guide. Hear the stories of WWII, the events leading up to it. What Berlin's Infamous Third Reich Sites Half-Day Walking Tour Includes? 3.5 hour guided Third Reich Tour. Proffessional English Speaking local guide. Travelers Reviews about Berlin's Infamous Third Reich Sites Half-Day Walking Tour? Travellers say that the tour guides are brilliant on this walking tour, energetic, knowledgeable and passionate about the topic. Get Your guides users have given the walking tour 4.6 out of 5. TripAdvisor and Viator users have left 5-star reviews. Comments point out that guides have actually received formal education on the topic of this tour. Printed or mobile vouchers will be accepted. Tickets should be cancelled in advance in order to receive a full refund. Viator require 7 days notice for a full refund and 3-6 days notice for a partial refund. Get Your Guide tickets are fully refundable up to 24 hours in advance. Available in English or German. Please wear appropriate clothing, tours will continue in wet and dry weather. Transport is not included, you will need a ticket for AB Zone. Meeting Point: Near the Brandenburg Gate or Outside the Hackescher Markt Train Station. Please check your meeting point in the booking comfirmation.